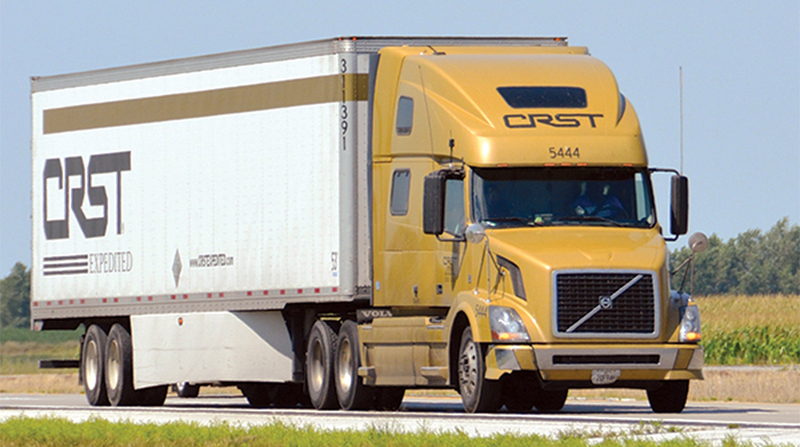 CRST International Inc. must stand trial in connection with a wrongful death lawsuit after a state supreme court overturned a lower court’s ruling in favor of the trucking company, according to court documents. The State of Wyoming Supreme Court on June 8 overturned by a 3-2 vote a February 2017 dismissal of the case by a Wyoming district court. Both CRST International Inc. and sister company CRST Expedited Inc. are named in the case. The case centers on the death of David Crashley, 39, of Casper, Wyo., whose Mazda CX-9 on Feb. 11, 2014, struck a parked CRST truck on the shoulder of eastbound Interstate 80, just outside of Rawlins, Wyo. According to the court document, at around midnight two CRST drivers left Salt Lake City, one in the sleeper berth and the other behind the wheel. At around 6:45 a.m. the driver asked his partner to relieve him, as he had become drowsy. He pulled the tractor-trailer onto the highway’s emergency lanes and turned on the hazard lights. Minutes later Crashley’s vehicle entered the shoulder and hit the back of the truck. He was killed instantly. It is not known why Crashley lost control of his vehicle, and records showed Crashley did not attempt to brake or avoid hitting the truck. The weather was not a factor in the accident. The CRST driver was cited by authorities for illegally parking in an emergency lane. Crashley’s estate filed the lawsuit against CRST and the drivers. In it, they argue that the driver stopped just over a mile away from a truck stop, where the pair could have more safely switched places. The estate also said multiple signs that prohibited parking in the area were visible to the drivers. Attorneys for CRST argued the company was not responsible for Crashley’s death because its driver pulled the truck entirely off of the highway, and noted the truck was parked in a lane where Crashley was not permitted to drive. They further argued that the accident happened because Crashley lost control of his car. In ruling in favor of CRST, the district court found that parking a tractor-trailer in an emergency lane was not sufficiently related to the cause of the accident, and entered a summary judgment on behalf of CRST. Crashley’s estate appealed that ruling to the Wyoming Supreme Court. Citing a similar case in California, the high court in Wyoming ruled in a majority opinion that parking the truck on the shoulder of the interstate created a reasonable and foreseeable increased risk to drivers, even though parking the truck did not cause Crashley to lose control of his car. The two dissenting Wyoming Supreme Court judges wrote that the majority incorrectly adopted California’s “foreseeability” law, stating that the California and Wyoming laws are fundamentally different. They also wrote that Crashley entering the shoulder caused the accident and his death. “CRST agrees with the trial court judge and the members of the Wyoming Supreme Court who decided that CRST was not, as a matter of law, a proximate cause of this tragic accident. While a narrow majority of the appellate court has determined that a jury must decide the question of proximate cause, CRST is confident that a jury will also reach the conclusion that CRST was not a proximate cause of this accident,” CRST General Counsel Lisa A. Stephenson said in a statement released to Transport Topics. CRST International ranks No. 19 on the Transport Topics Top 100 list of the largest for-hire carriers in North America.